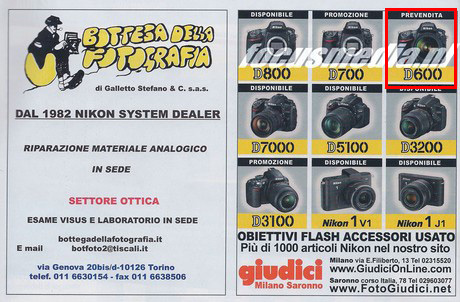 A reader of Dutch magazine Focus spotted the Nikon D600 featured in a Nikon SLR/iLC line-up advertisement by an Italian dealer in Milan(o). The listing puts the D600 right next to other full-frame models in the Nikon range, the D800 and D700. Nikon D600 is rumored to be released at Photokina 2012. You may see more news and rumors about D600 here.